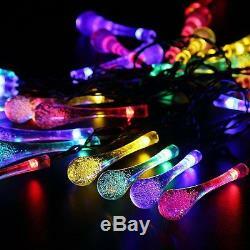 Solar String Lights Outdoor Solar String Lights 19Ft 30 LED Water Drop. Rechargeable but NO wall socket needed. Solar String Lights is specially design to recharge by solar power system which transfers the sun light power into electrical power so they don't require a mess of chords to be plugged in to a wall socket. 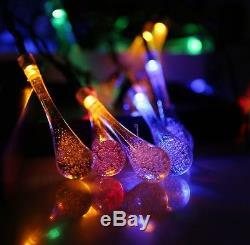 These bulbs would be perfect for anytime of the year for entertaining or just to add something special to the decor. 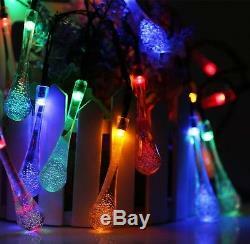 The bulbs are waterproof and durable. Well made of heavy duty materials to with stand the weather. 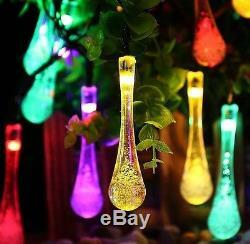 The multi color (Red, Yellow, Blue, Green) Frozen Raindrops Solar String Lights add some interest to the yard without blinding you. 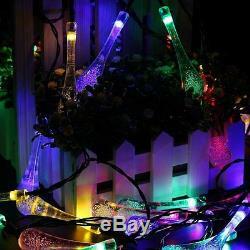 Best choice for Garden, Homes, Wedding, Summer Camping, Christmas, Party, also can be hung on tree branches, bushes, roof, eave, fence or any other places you wish. Came with a stand and a spike so that you can place them in your garden. Please be careful when inserting in hard clay or frozen ground. 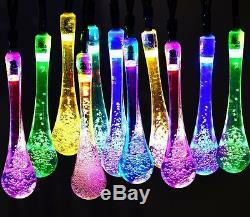 Light color: Multi color (Red, Yellow, Blue, Green) 2. Battery: built-in 600mAH AA NI-MH battery 3. Charging time: 6-8 hours 4. Working time: 8-10 hours 5. Switch: Power ON/OFF& MODE (Steady/Flashing) 6. Total Length of String: 6m 8. Length of lead line: 1.5m 9. Length between each bulb: 0.15m What's in the Box? 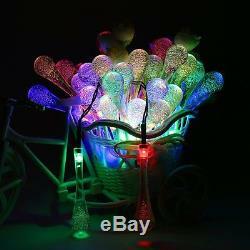 1 x 30 LEDs Frozen Raindrops Solar String Light 1 x Ground Stake 1 x Solar Panel 1 x User Manual. 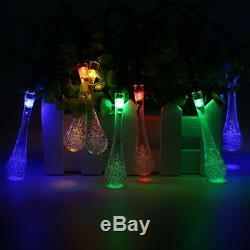 Environmentally Friendly: Solar String Lights turn solar energy into electricity to light up at night automatically to add ambiance and life. It's environmental to use. There are two Light Modes: Steady / Flash. 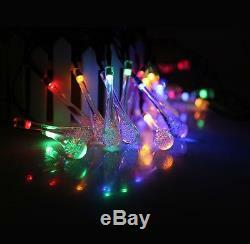 IP65 Waterproof & Rain Resistant: Solar String Lights are suitable for indoor and outdoor decoration. Energy-Saving & Easy operation: Solar String Lights will be charged automatically when the panel is directly shined by the sunlight. Turn the switch on and let the panel up, it will automatically light on at night and turn off during day. Beautiful & Romantic Design: With 30pcs led light, these Solar String Lights help to beautify your garden, patio, lawn, porch, gate, yard, etc when you turn the switch on. 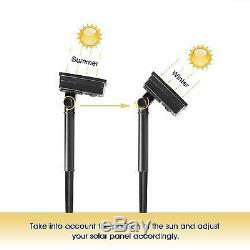 Long working time: With a full charge of 6-8 hours, the Solar String Lights will provide lighting for 8-10 hours. Product Dimensions: Length: Nonein, Width: Nonein, Height: Nonein, Weight: None pounds. 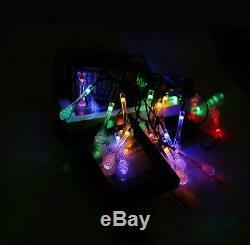 Package Dimensions: Length: 7.2in, Width: 3.8in, Height: 3.3in, Weight: 0.9 pounds. We reserve the right to cancel any order for any reason at any time. We are not responsible for undeliverable addresses. Message us for return instructions. All of our items, unless otherwise stated, will only run on 120 volts. Please check to make sure your country complies with these specifications. We will work with you to resolve any problem you may have. The item "Outdoor Solar String Lights 19Ft 30 LED Water Drop Garden Patio Fairy Xmas Decor" is in sale since Wednesday, May 10, 2017. 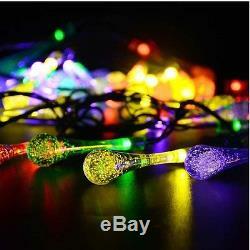 This item is in the category "Home & Garden\Yard, Garden & Outdoor Living\Outdoor Lighting\Outdoor String Lights". The seller is "maxqual-store" and is located in Chicago, Illinois . This item can be shipped to United States.